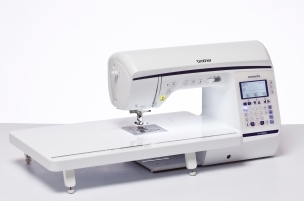 The brother Innov-IS 1800Q is a fabulous sewing machine with advanced functionality. Equipped with a fabulous range of stitches, a wide table and an array useful features, this machine is ideal for quilting enthusiasts and experienced fashion sewers. The Brother Innov-IS 1800Q gives you an impressive 234 built-in stitches to choose from. These include 99 utility stitches, 133 decorative stitches and 10 styles of automatic one step buttonhole. You have all the options required to help you to produce professional looking work and to explore your creativity. Stitch width and stitch length are adjustable and stitch selection is simple via the touch sensitive keypad. The large LCD screen displays all the information that you need. You can combine and edit stitches, create your own stitches and commit new stitches to the machine’s memory. This machine features Brother’s Square Feed Drive System (SFDS) which means that different weights of fabric will all feed smoothly and the excellent stitch quality is always maintained. The Brother Innov-IS 1800Q also includes a sideways feed for even greater versatility. Speed control makes tackling intricate work easier and you have a pivot function so you can sew around corners with ease. The knee lift means that you can sew with both hands on your work at all times and this machine also features a lock stitch button, a presser foot up/down button and fully automatic thread tension. The Brother Innov-IS 1800Q lets you explore your potential to the max. With a fabulous selection of stitches, the ability to create your own and such exceptional functionality at your fingertips, what more could you ask for?